Alasdair Roberts presents a clear and persuasive analysis of the technocratic turn in public policy since the 1990s. 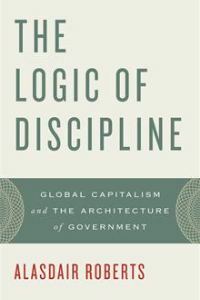 The Logic of Discipline provides a convincing and surprisingly readable assault on Public Choice economics and is a welcome addition to the ranks of analyses of ‘what went wrong’, finds Steve Coulter. The Logic of Discipline. Global Capitalism and the Architecture of Government. Alasdair Roberts. Oxford University Press. 216 pages. October 2011. What happens when democracy gets in the way of efficiency? In The Logic of Discipline, Suffolk University Professor Alasdair Roberts argues that the economic liberalization of the 1980s onwards was accompanied by a counter-revolution against the very idea of liberal democracy itself. Although the idea of self-rule by citizens ostensibly remained firmly established during this period, the book sets out numerous examples from the realm of economic governance that tell a different story. The chaos and decay of the 1970s indicated to a number of theorists and policy-makers, mostly on the right, that wide political participation was inimical to the smooth working of the capitalist economy. Popular sovereignty therefore found itself constrained, replaced by a logic of discipline. Decisions that used to be made by elected officials became the province of experts and technocrats who operated according to non-political incentives. An obvious example – and the book is full of telling examples – is the trend towards independent central banks in many advanced industrial democracies during the 1990s. Central banks, or so the idea goes, need to have autonomy in order to make hard choices about monetary policy. When politicians are in control they adopt expansive policy stances that maximize their chances of re-election in the short and medium term but at the long term cost of higher inflation. In fiscal policy also, the notion took hold that fiscal discipline required a rule-based approach limiting politicians’ ability to embark on recklessly expansionary policies to buy votes, yoking the budgetary cycle to the political cycle. The rules-based approach also provided balm to sooth worries over poor infrastructure provision. Public choice analysis implied that politicians viewed major construction projects as schemes to reward their supporters. Meanwhile, civil servants lacked the project management skills even to bring them in on time or within budget. Engaging private infrastructure managers on long-term contracts got around this problem, as the correct incentives could be designed to ensure they delivered value for money. But experts are fallible, as the financial crisis has shown us. Even before the banking system imploded, these schemes were running into trouble. It’s even possible they helped cause it. The protocols on monetary policy, which encouraged central bankers to focus on narrow monetary targets, stoked asset bubbles instead. Fiscal rules were finessed, or ignored, as public budgets continued to balloon. Savvy private construction firms ran rings around government negotiators when infrastructure contracts were being agreed. Group think in central bank and regulatory authorities was partly to blame. Reformers, with their naïve institutionalists’ faith in the ability of the law to shape behaviour, assumed that contracts alone would ensure that managers could be empowered and the interests of private sector firms aligned with those of the state. But they seriously underestimated the ability of powerful interests to insinuate themselves in the policy process. Ultimately, there was also considerable ambivalence about reform. Citizen and advocacy groups objected to the delegation of so much power to experts and ensured, in many cases, that lines of accountability remained, blunting the original purpose of the reforms and leading to confusion. Roberts has written an admirably clear and persuasive analysis of the technocratic turn in public policy since the 1990s. The promises of regulators and governments that a ‘hands off’ approach to governance would deliver effortless efficiency have been seriously blunted, and this book shows exactly why. The book provides a convincing, and surprisingly readable, assault on Public Choice economics and is a welcome addition to the ranks of analyses of ‘what went wrong’. In the new era of, apparently, ‘responsible capitalism’ it would be refreshing to think that lessons have been learnt about how far public sector management can be sub-contracted to experts, and democratic accountability short circuited. But with technocrats taking over the Italian and Greek governments, and surely more to follow, it seems likely the logic of discipline has further to run. Steve Coulter is Senior Economics and Business Analyst for BBC News, and writes regularly for the BBC News website on UK economic policy. He is also an Associate Fellow of the Social Market Foundation think tank and wrote the SMF’s recent paper on industrial policy, Manufacturing Prosperity. He is currently working on a project on the media’s coverage of the financial crisis with the Journalism School of City University. Steve received his PhD in European Political Economy from the LSE’s European Institute. Read more reviews by Steve.